For year-round warmth without bulkiness, Pantherella socks are hard to beat. 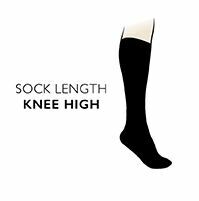 Amazingly lightweight and beautifully worsted woven from superfine merino wool, these classic ribbed knee highs combine elegance with strength, outstanding breathability and anti-microbial qualities. You'll love the finely-made quality of these luxury socks, from the secure grip tops to the high comfort offered by the hand linked toes for smooth seams that long-time Pantherella wearers value. Outstanding breathability and anti-microbial qualities.